The ratio of marketers earning top marks for their ability to demonstrate their value and impact – the Value Creators – remains unchanged from last year, only 1 in 4. The study results constitute a “call to arms” for this elite group of marketers: by resting on their past success, they have actually lost ground. Value Creators are better by a factor of three to five at data usage. Over half of Value Creators improved their impact on business results with six of the nine key business measures. The number of marketers moving into the ranks of Sales Enablers grew and represents 40% of study participants. This year’s study tells a story about how this group advanced toward Value Creator status. The Sales Enablers, the Middle of the Pack group, is the only group that experienced increased satisfaction with their MPM capabilities. Measuring marketing’s value and contribution remains a top priority, rated 8.9 by Value Creators on a scale of 1 to 10 where 10 equals “extremely important.” The challenge in measuring value lies in selecting the right metrics. The use of dashboards, practiced by almost 80 percent of Value Creators, correlates to improvement in and satisfaction with marketing measurement and reporting, Marketing’s ability to justify its value, and how well marketing metrics measure factors that link Marketing’s results to corporate business objectives. 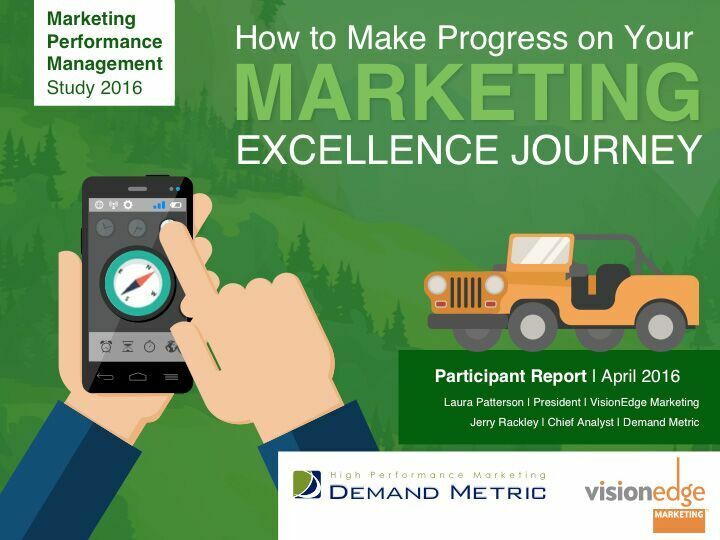 The best performing marketing teams know more than marketing; they understand the business. Over two-thirds of study participants report that Value Creators demonstrate knowledge and understanding of the financial, accounting and operational aspects of the business. “What the current study teaches us is that a marketer’s MPM capabilities will atrophy if they’re not in constant use,” says Jerry Rackley, chief analyst at Demand Metric Research Corporation. “The Value Creators are still the best, still the most capable of using data and metrics to manage Marketing’s performance and deliver results. How the best marketers leverage operations and what three key approaches they employ for marketing measurement and data management. The three capabilities that are indicators of an organization’s level of MPM maturity and are vital for assuring that Marketing’s metrics development process is sound. Three key attributes of the most successful marketers that boost the perception of Marketing’s credibility. About VisionEdge Marketing: VisionEdge Marketing (VEM) provides proven expertise to help companies improve marketing accountability, measurement and analytics; create outcome-based marketing metrics; develop dashboards; leverage processes, data, systems, and use data and analytics to make strategic market, customer and product decisions. Visit VisionEdge Marketing at http://www.visionedgemarketing.com and follow @lauravem. About Demand Metric: Demand Metric is a marketing research and advisory firm serving a membership community of over 80,000 marketing professionals and consultants in 75 countries. Offering consulting methodologies, advisory services, and 500+ premium marketing tools and templates, Demand Metric resources and expertise help the marketing community plan more efficiently and effectively, answer the difficult questions about their work with authority and conviction and complete marketing projects more quickly and with greater confidence, boosting the respect of the marketing team and making it easier to justify resources the team needs to succeed. Visit: http://www.demandmetric.com.